› Author AffiliationsJan Veselý gratefully acknowledges the Czech Science Foundation (No 16-23597S) for financial support. Bedřich Formánek thanks the Charles University Grant Agency (grant number 392315) for financial support. Dedicated to Prof. Bäckvall to his 70th anniversary. 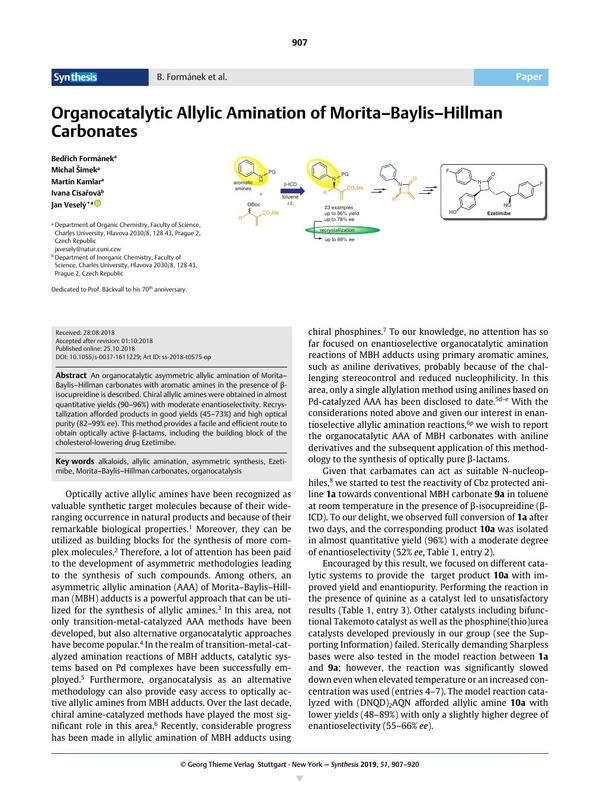 An organocatalytic asymmetric allylic amination of Morita–Baylis–Hillman carbonates with aromatic amines in the presence of β-isocupreidine is described. Chiral allylic amines were obtained in almost quantitative yields (90–96%) with moderate enantioselectivity. Recrystallization afforded products in good yields (45–73%) and high optical purity (82–99% ee). This method provides a facile and efficient route to obtain optically active β-lactams, including the building block of the cholesterol-lowering drug Ezetimibe. Supporting information for this article is available online at https://doi.org/10.1055/s-0037-1611229. 19 X-ray crystallographic data have been deposited with the Cambridge Crystallographic Data Centre (CCDC) under deposition number 1812260 for 14c, and can be obtained free of charge from the Centre via its website (www.ccdc.cam.ac.uk/getstructures). 34 18a (R1 = R2 = Ph) was identified by 1H NMR spectroscopy and mass spectrometry. 35 Incomplete conversion of starting material was observed probably due to sensitivity of Sn[N(TMS)2]2 reagent to traces of moisture.